Another couple of movies down. The Graduate was fascinating. I had a vague notion of the story but really only the first half, the way the character developed and particularly Dustin Hoffman's acting were fascinating. The Hustler... was pretty much what I expected with a tacked on romance that I should have expected. I was a little disappointed. On a somewhat related note I watched Chaplin. This is not a new film but I am glad I didn't watch it until after seeing a bunch of his movies. It really made me appreciate his achievements that much more. The acting in the film is also excellent with an all star line up. This team was a bit of a mad rush over the holidays in order to have them table ready for the Quake last weekend. As a result, there aren't a lot of in progress pictures to show their developmental progress. I did a lot of experimentation with them despite this however particularly regarding manual shading and highlighting which really paid off for the creams and goblin skintones. One thing I found to my chagrin is that I really don't have the range of reds that I need to get good layering and shading on these (a big part of the palettes) which I think let down the models overall. So here they are in their full glory! A couple of photos taken at West Coast Quake of the team getting ready to perform their worst. 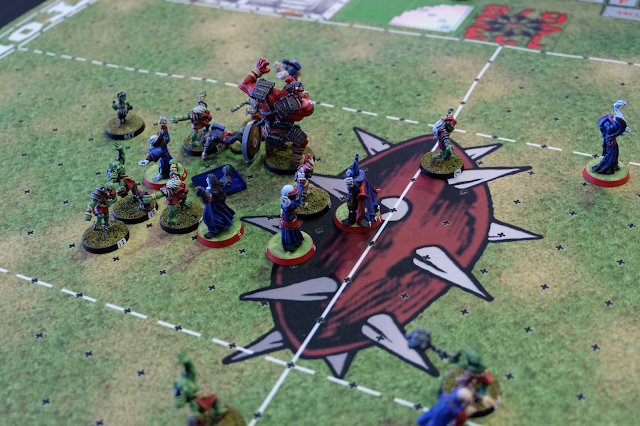 My next post will be a look at my (less than) stellar performance at the Tournament. 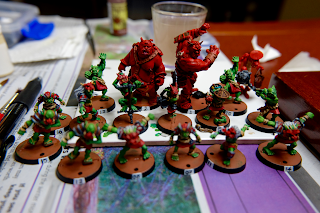 I'd been hoping to get a couple more posts up this week to show off the headway I've made in painting up the Goblin team for the Quake. Unfortunately I've not had the chance to take photos of the new hotness and the heavy downpours in the Bay Area have left me needing to put some attention to preparing for a business trip in the coming week so it is likely to be a while before I can get something more substantial together. In the meantime I was able to knock another of the top 250 movies off of the list. Witness for the Prosecution is another example of why I do this list. Smart, fun with an excellent twist that makes the film a delight to watch. Just a quick update. A friend of mine asked on facebook for some advice on Gold NMM and it just happened that I worked on some recently so I figured I would post a couple of images and share my thoughts. I should note that this is only my second or third attempt at NMM gold and I am hardly an expert painter but I was pretty pleased with the results. In this case it's the bracelets being worn by my Goblin team Oni troll. Click on the images to see them full size. 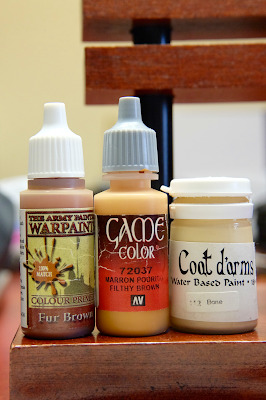 I have found it really important to start with a much darker color than you think you are going to need. Here I started with Fur Brown and I think that even this is a little too light really. If I'd had more patience, I would have brought it up from Oak brown. Even though you don't really leave any of this darkest color showing; it comes through in the depth and helps shade the recesses. The Haikido Hackers are chugging along. Most of the basic goblins are now done. I will do a full team review post soon when I have everything in place. 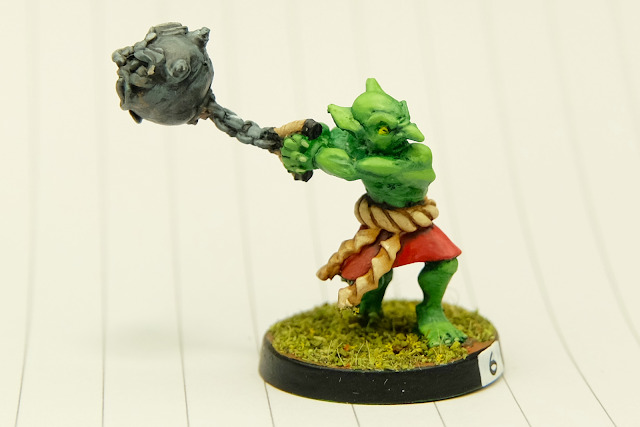 In this post, I wanted to show off some of the work on layering that I have been doing recently, particularly the Obi (belt) on the goblin fanatic where I put a little time in building up from dark to light to get some really awesome effect. All of this has been taken directly from the latest lesson by Miniature Monthly. I continue to be impressed by the classes that Aaron, Elizabeth and Jonathan have been putting together. You can see here my continuing efforts to work on free hand painting. The Rising Sun banner reads 'Banzai'. It is a term that came to the western world from World War 2 and literally means ten thousand years - a contracted form of a Japanese battle cry. Finally this dude is one of my favorite of the standard goblin sculpts. I really like the shoulder pads and had a lot of fun painting them up.